NewLink’s CEO describes his company’s focus on the IDO pathway in cancer immunotherapy. One of the biggest themes in cancer immunotherapy research right now is trying to use multiple drugs in combination with each other. The goal is to make them work for more patients and in more types of cancers. Tumors unfortunately are multifaceted and have more than one means by which they naturally prevent the immune system from seeing them as foreign and attacking. Therefore, it might take a combination of treatments that act on multiple pathways to have the largest effect. One such pathway that is being actively pursued is called IDO. This has been a focus of the cancer immunotherapy research community lately because IDO drugs are now making it into the last stage of clinical testing in some cases. To help our readers learn more about it, we decided to go straight to the CEO of a company that is focused on IDO, NewLink Genetics (Nasdaq: NLNK). The Cancer Immunotherapy ETF (Nasdaq: CNCR) is pleased to support companies like NewLink that are working on novel approaches like IDO. To see a list of CNCR’s current holdings please click here. Charles J. 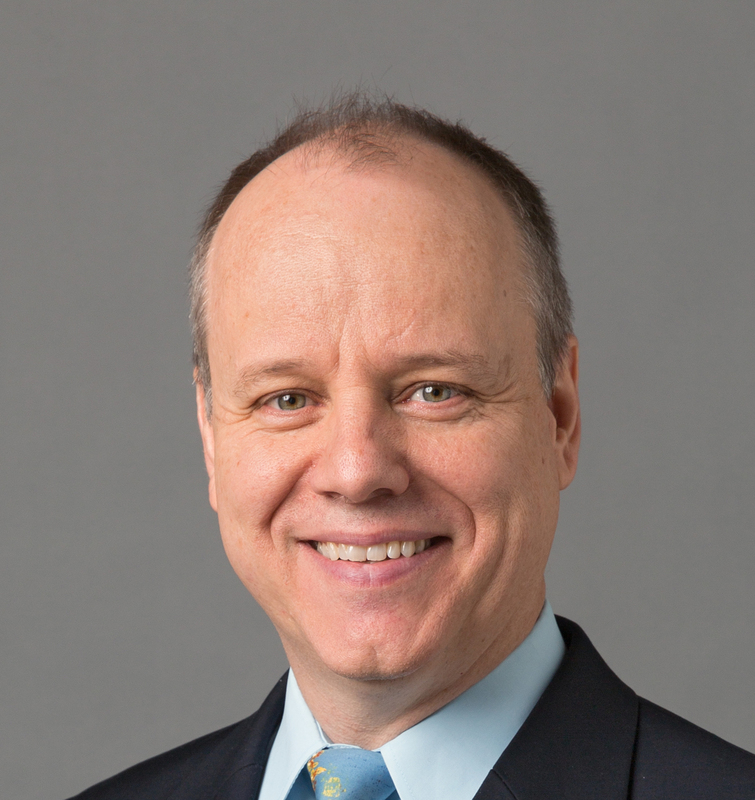 Link, Jr. MD, is NewLink’s Chief Executive Officer and Chief Scientific Officer. Dr. Link is a leading expert in the field of immunotherapy. Some of his many accolades include completing his residency and fellowship training in medical oncology at the National Cancer Institute, practicing oncology for 18 years, and co-founding NewLink in 1999. We posed 10 questions to him that we hope will better educate readers on the rationale behind IDO, how NewLink is utilizing this pathway with its drug indoximod in clinical trials, and what the company is looking forward to over the coming year. NewLink is focused on the IDO pathway in cancer. What is IDO and what role does it play in cancer immunotherapy? The IDO pathway regulates immune response by suppressing T cell function and enabling local tumor immune escape. In other words, tumor cells may hide from the immune system by using the IDO pathway. Inhibition of the IDO pathway allows tumors to be “seen.” The potential role IDO inhibition has as a cancer immunotherapy is to be used in combination with therapies such as checkpoint inhibitors, chemotherapy or cancer vaccines. These therapies activate the immune response, with IDO “cloaking” the tumors. With indoximod, our IDO pathway inhibitor, the tumors are “uncloaked” such that the therapeutics can work to destroy the tumor cells. Your lead drug Indoximod impacts IDO in a different way than some competitor IDO inhibitors. How does it inhibit IDO specifically? Is there an advantage to this? 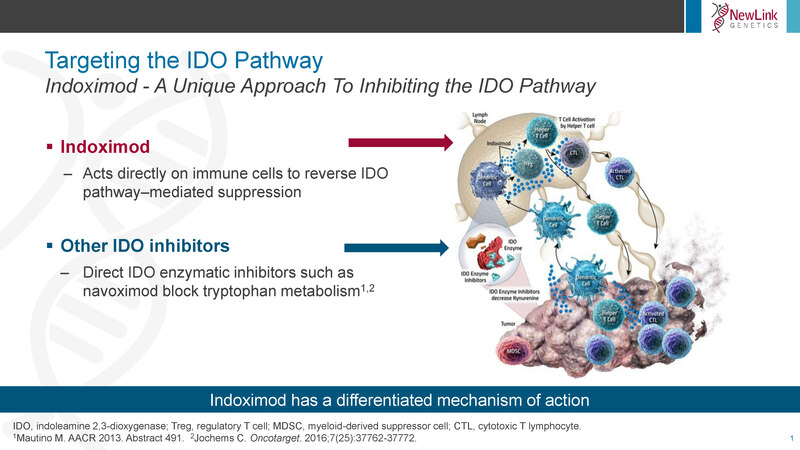 Indoximod has a differentiated mechanism of action (MOA) within the IDO pathway in that it acts directly on the immune cells and functions as a tryptophan mimetic rather than targeting the IDO enzyme directly. Whether there will be advantages to this mechanism has not yet been determined but the clinical results appear similar to data presented thus far with other IDO inhibitors. The unique mechanism may offer opportunities to explore different combinations and indications than the direct inhibitors, but this remains to be seen. You have done a lot of work with Indoximod in melanoma and recently initiated a phase 3 clinical trial in combination with PD-1 inhibitors. How did you choose melanoma as the first main target for the drug? The decision to pursue melanoma is based on three basic observations: First, melanoma is generally an immunotherapy responsive disease. Second, the current immunotherapy combination of PD-1 plus ipilimumab is limited due to toxicity. Finally, and most importantly, the most promising data with IDO, including indoximod, plus PD-1 therapy to date has been in advanced melanoma. These are the major factors why we are pursuing advanced melanoma as the initial indication, but we believe the opportunity for indoximod is much broader, including multiple malignancies. What timeline do you expect for the melanoma study? How long will it take to enroll and when do you estimate we might see initial data from it? Our goal for the Phase 3 Pivotal trial of indoximod in combination with PD-1 inhibitors for patients with advanced melanoma is to be enrolled by the end of 2018. We will have a better idea of the timeline for once it is underway. You recently announced a collaboration with AstraZeneca to test Indoximod in combination with the PD-L1 inhibitor durvalumab in pancreatic cancer. Why did NewLink and AstraZeneca choose pancreatic cancer? Patients with pancreatic cancer represent one of the most significant unmet needs in oncology, and this indication is generally viewed as non-responsive to immunotherapy. However, the phase 2 data with indoximod plus standard of care show the potential to provide benefit in this difficult disease. This trial will compare the 4 drug regimen to the current standard of care in a patient population that has to date shown little benefit from immunotherapy. Are there any other cancer types you think might be well suited for IDO and PD-(L)1 combinations? What determines a promising target? Indoximod’s differentiated mechanism may provide for unique clinical opportunities such as the one we are exploring in pancreatic cancer. However, the potential synergy of IDO inhibition with the checkpoint targets such as PD-1, PD-L1 and CTLA4 presents a wide array of potential opportunities in both hematologic malignancies and solid tumors. What types of improvement are you trying to make in future versions of this drug? Our current version of indoximod, which is a new salt formulation, will be used in all new trials going forward. In addition to providing additional patent protection, this formulation has the potential for improved pharmacodynamics properties that may translate into advantages in efficacy and patient compliance. This formulation is now being used in our Phase 1b study of indoximod in combination with standard of care chemotherapy for patients with newly diagnosed Acute Myeloid Leukemia (AML). What are NewLink’s primary goals and milestones over the next twelve months? 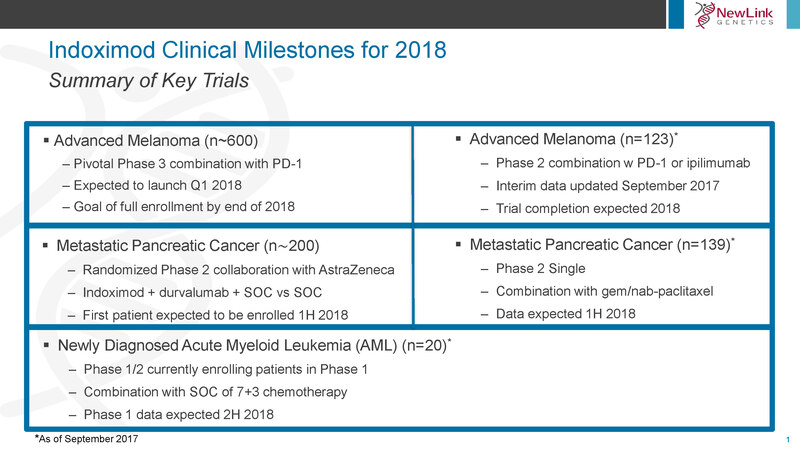 Over the next twelve months we will be focused on the Phase 3 pivotal trial of indoximod in combination with PD-1 inhibitors for patients with advanced melanoma and our goal is to complete enrollment by the end of 2018. We are also looking forward to seeing the clinical program advance in other indications such as pancreatic cancer and AML and feel there are opportunities for additional collaborations which we will continue to work toward. Where do you see the future of cancer care headed over the long term? We believe immunotherapy is here to stay and will continue to evolve as discoveries lead to more targeted therapies and more varied combinations. What does shareholder support mean to you? We are honored to have the support of long-time shareholders as well as newcomers to indoximod and NewLink. Their support allows us to continue the important work we are doing to bring new therapies to patients with cancer. The Cancer Immunotherapy ETF is designed to invest in immunotherapy leaders like NewLink. We thank Dr. Link for his time, and wish everyone at the company all the best as they work to make IDO a cornerstone of combination therapy in the future. View all holdings in the Loncar Cancer Immunotherapy ETF. Opinions expressed are those of the author or Funds and are subject to change, are not intended to be a forecast of future events, a guarantee of future results, nor investment advice. Fund holdings and allocations are subject to change at any time and should not be considered a recommendation to buy or sell any security. Sign up to receive the latest news about our ETFs and more. Copyright ©2019 loncar funds. All rights reserved. A basis point is a common unit of measure for interest rates and other percentages in finance. One basis point is equal to 1/100th of 1%, or 0.01% (0.0001). The Loncar Cancer Immunotherapy Index is an index of 25 securities that have a strategic focus on the area of cancer immunotherapy, or harnessing the immune system to fight cancer. Quotes for the index can be found under the symbol “LCINDX” on the Bloomberg Professional service and other financial data providers. One may not directly invest in an index. The Loncar China BioPharma Index is an index of 28 securities that have a strategic focus on advancing China’s biopharma industry. Quotes for the index can be found under the symbol “LCHINA” on the Bloomberg Professional service and other financial data providers. One may not directly invest in an index. The Hong Kong Stock Exchange (HKEX) is the primary stock exchange in the Hong Kong Special Administrative Region of China. Nasdaq is one of the primary stock exchanges in the United States. Carefully consider the Fund’s investment objectives, risk factors, charges and expenses before investing. This and additional information can be found in the Fund’s prospectus, which may be obtained at www.loncarfunds.com. Read the prospectus carefully before investing. Investing involves risk. Principal loss is possible. The fund may trade at a premium or discount to NAV. CNCR will invest in immunotherapy companies which are highly dependent on the development, procurement and marketing of drugs and the protection and exploitation of intellectual property rights. A company’s valuation can also be greatly affected if one of its products is proven or alleged to be unsafe, ineffective or unprofitable. The costs associated with developing new drugs can be significant, and the results are unpredictable. The process for obtaining regulatory approval by the U.S. Food and Drug Administration or other governmental regulatory authorities is long and costly and there can be no assurance that the necessary approvals with be obtained and maintained. The Fund may invest in foreign securities, which involve political, economic, currency risk, greater volatility, and differences in accounting methods. The Fund is non-diversified meaning it may concentrate its assets in fewer individual holdings than a diversified fund. Therefore, the Fund is more exposed to individual stock volatility than a diversified fund. The Fund invests in smaller companies, which may have more limited liquidity and greater volatility compared to larger companies. The Fund is not actively managed and may be affected by a general decline in market segments related to the index. The fund invests in securities included in, or representative of securities included in, the index, regardless of their investment merits. The performance of the fund may diverge from that of the Index and may experience tracking error to a greater extent than a fund that seeks to replicate an index. Shares are bought and sold at market price (not NAV) and are not individually redeemed from the Fund. Brokerage commissions will reduce returns. RISK FOR THE CHNA ETF: The biopharmaceutical industry in China is strictly regulated and changes in such regulations, including banning or limiting certain products, may have a material adverse effect on the operations, revenues, and profitability of Biopharma Companies. The laws and regulations applicable to the process of administrative approval of medicine and its production in China require entities producing biopharma products to comply strictly with certain standards and specifications promulgated by the government. Changes in currency exchange rates and the relative value of non-U.S. currencies will affect the value of the investment. Currency exchange rates can be very volatile and can change quickly and unpredictably. Investments in non-U.S. securities involve certain risks that may not be present with investments in U.S. securities. For example, investments in non-U.S. securities may be subject to risk of loss due to foreign currency fluctuations or to political or economic instability. Investments in non-U.S. securities also may be subject to withholding or other taxes and may be subject to additional trading, settlement, custodial, and operational risks. These and other factors can make investments in the Fund more volatile and potentially less liquid than other types of investments. To the extent the Fund invests a significant portion of its assets in the securities of companies of a single country or region, such as China, it is more likely to be impacted by events or conditions affecting that country or region. The Fund is a recently organized, non-diversified management investment company with no operating history. As a result, prospective investors have no track record or history on which to base their investment decision. The Fund is considered to be non-diversified, which means that it may invest more of its assets in the securities of a single issuer or a smaller number of issuers than if it were a diversified fund. The Fund is not actively managed and the Fund's sub-adviser would not sell shares of an equity security due to current or projected underperformance of a security, industry or sector, unless that security is removed from the Index or the selling of shares of that security is otherwise required upon a reconstitution of the Index in accordance with the Index methodology. To the extent the Fund invests more heavily in particular sectors of the economy, its performance will be especially sensitive to developments that significantly affect those sectors." Exchange Traded Concepts, LLC serves as the investment advisor, and Vident Investment Advisory, LLC serves as a sub advisor to the fund. The Funds are distributed by Quasar Distributors, LLC, which is not affiliated with Exchange Traded Concepts, LLC or any of its affiliates. You are now leaving the Loncar Funds website. The following landing page may contain information concerning investments, products or other information. Exchange Traded Concepts LLC, the Fund Advisor are not responsible for the accuracy or completeness of information on non-affiliated websites. The material available on non-affiliated websites has been produced by entities that are not affiliated with Exchange Traded Concepts LLC. Descriptions of, references to, or links to products or publications within any non-affiliated linked website does not imply endorsement of that product or publication by Exchange Traded Concepts LLC. Any opinions or recommendations from non-affiliated websites are solely those of the independent providers and are not the opinions or recommendations of Exchange Traded Concepts LLC, which is not responsible for any inaccuracies or errors.